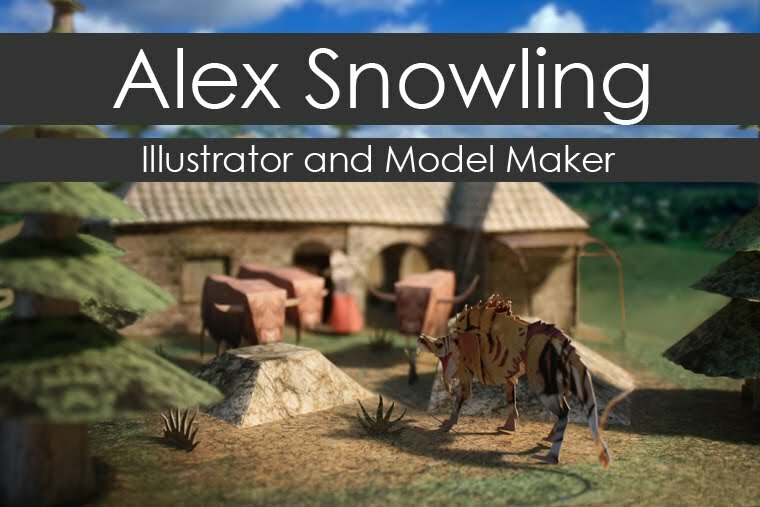 Alex Snowling: Illustrator and Model Maker: Stephen the Bear. For those of you planning on going to London for D&AD you can pick up a Stephen the Bear business card... but before you do, here's a little history. Stephen started out as a concept I did for a Goldilocks animation that my group and I made in the second year for electives. Electives is basically to study and complete a project out of your area of study, and I chose animation two years running as it has always intrigued me. After a bit of rummaging I have found that animation for your viewing enjoyment! Well Beloved Tales: Goldilocks, The Three Little Pigs and The Three Bears and the Wolf. This was a collaboration between myself, Megan Bentley, Oli Osborne and Sean McCarthy. Megan is an Illustrator like myself, and Oli and Sean are Graphic Designers. The whole thing was painted by various members of the team (my pieces were the bears and the wolf) and is animated under a camera using cut-outs and stop frame animation. Since then Stephen was woven into a small series I was playing around with called Scruffs, I developed his character and created a few story concepts, but then I started creating Gevaudan for University and Scruffs was left in the dark for a while. So, as a homage to Stephen the Bear; he and his many happy clones will be greeting you at D&AD!